I’m traveling on business in Southern California as I type this and soon to be in Northern California. Today my colleague and friend, Sharlene, a native Californian, said to me, as we were driving in eight lanes wide of California traffic, “You know I don’t really what the prairie looks like. That’s why I have to come visit you.” The glitz and the lights of Southern California are far from the prairie I call home. But I thought for a moment about where I would take Sharlene or any of you that would come visit the rural, remote prairie of North Dakota. There are not “destinations” like there are in Southern California…or any populated area. No shopping sprees or Starbuck’s. But there is a bakery I adore we could visit. 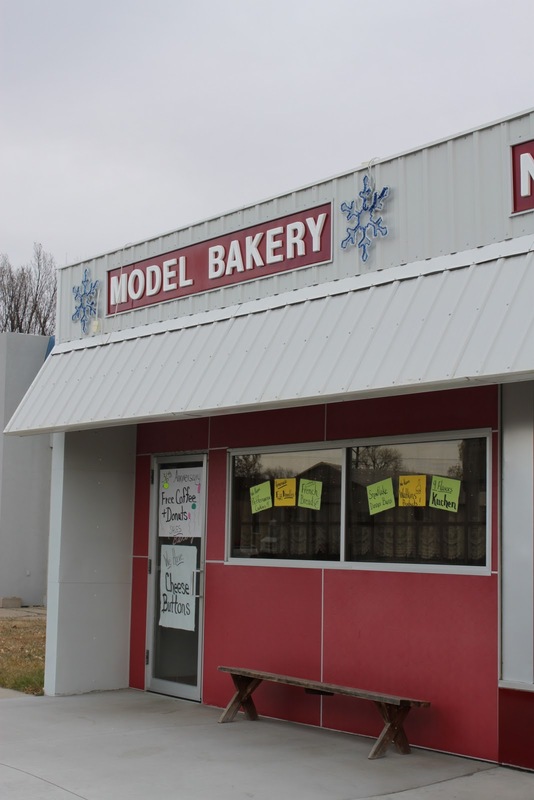 It sells authentic German from Russia baked goods, made from recipes passed down through generations. We could eat Blachenda which is like your own personal pie, flaky crust most often with pumpkin filling. My mother-in-law makes her pumpkin filling from the actual orange pumpkins, not just canned pumpkin from the grocery store shelf. Cheese Buttons and we could each have a Creme Puff. It might be not Southern California. There aren’t eight lanes of traffic. There are only two lanes and no traffic. We are far from Starbuck’s. But the prairie has hidden gems that I appreciate even more after being away from them. I find joy in the the simple pleasures of authentic baked goods baked by the owners and shared with family and friends over a cup of coffee. Share your Wordless or Wordy Wednesday post today by linking up below and be sure to visit at a few blogs because to me that is the best part of social media…connecting. 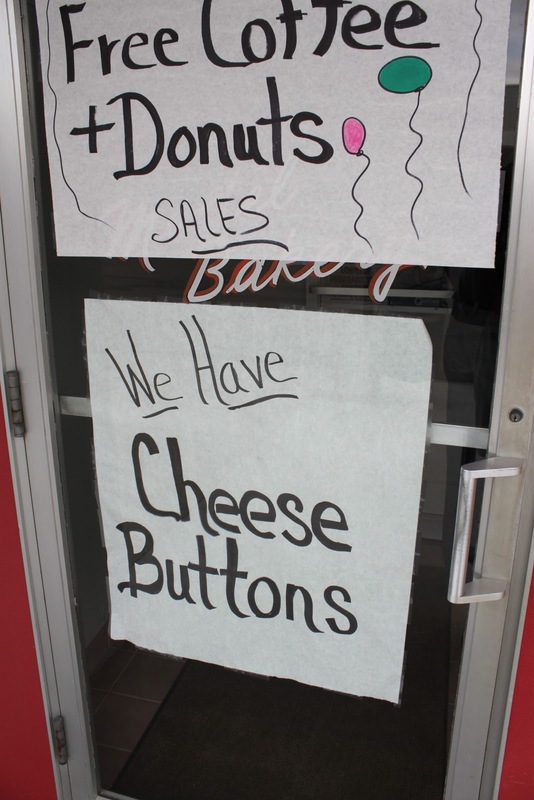 Cheese buttons. I never heard of them! I had the same problem when my family visited over the summer, i didn’t have too many places to take them but we seemed to stay busy all the same. 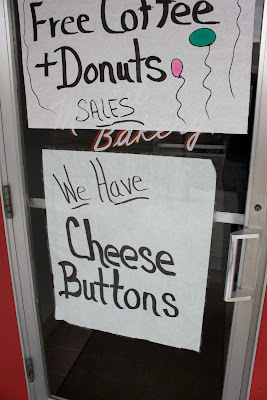 i wanted to know what cheese buttons were too! 🙂 that looks like a yummy place to explore! i’d have to eat my way thru it! You are going to be in Northern California? 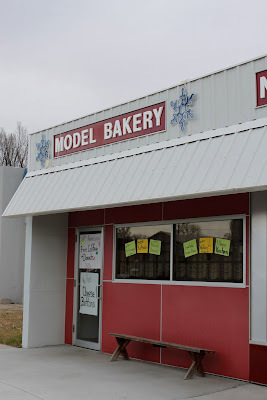 What a nice little bakery! To answer your question I don’t know where I would take soemone visiting. We took a New York friend to see the golden gate bridge but that is hours from my hometown. We also took him to see rice fields and farm land. But, there is only a bar out there. Have a great trip! Hope you are home soon! Great photos! My favorite hidden gem is a small diner called Mr. Apple Pie. It’s family owned and they have cheap eats! My hubby and I would go there every Sunday for breakfast or lunch when we were younger! Thanks for linking up at Momma T and Baby E! Is there anything better than a bakery?!? This post made me smile because I can relate. I always encourage my friends, who live in more exciting places than I do, to visit our farm. And I sometimes think about what I’d show them in our area. We have a lot of rural history such as a one-room schoolhouse museum down the road and an old printing museum in a nearby town. Those kinds of things don’t seem like much and they probably wouldn’t excite a lot of people. But every community has something to offer and I think it’s important to be proud of where you come from. You must come to Maple Beach on Lake Lida in Minnesota…best burgers ever! But get there early, there are only 3 booths and 4 bar stools in this quaint little restaurant overlooking the lake!